Many indigenous missionaries and pastors in the foreign field have been limited by their own poverty from having an adequate library to use as a resource for studying the Scriptures. As a result of this greatly overlooked need, HeartCry has purposed to assist our partners with biblical and theological literature. There are ministers on the foreign field who have served for years and have planted several congregations, and yet, they have never even owned a concordance or a Bible dictionary. How much more prosperous would their ministries have been if they had been privileged to have even the most basic tools for Bible study? It is for this reason that HeartCry seeks to provide pastoral libraries to indigenous missionaries and pastors in the foreign field. A pastoral library may include a Study Bible, an exhaustive concordance, a Bible dictionary, a one-volume commentary on the Bible, and a systematic theology. The cost of a pastoral library is usually little more than $150 or $200 (U.S.), and yet the fruit of such a gift cannot be measured. It is humbling to see indigenous workers who have labored for years literally weeping with joy upon receiving an exhaustive concordance and a Bible dictionary. For many, it is the answer to years of prayer. At HeartCry, we recognize that the Great Commission is not about sending missionaries, but about sending God's truth through missionaries. We also realize that the churches in more developed countries have been given a weighty stewardship over a vast amount of theological resources. While the English-speaking church is swimming in a great ocean of sound theological literature and study aids, most Christians in the rest of the world are languishing in a desert. In the nation of Italy, HeartCry has entered into partnership with Chiesa Sola Grazia (Grace Alone Church) and Coram Deo Ministries in Porto Mantovano, with the purpose of publishing theological works in this needy country. Good literature is absolutely necessary, so that the young Italian church may be strengthened in its faith. Italy is called the “Graveyard of missionaries”. Many good workers come from abroad, but the vast majority leave the mission field by the 3rd year because of depression, lack of results, difficulties with the Italian culture, bureaucracy, and corruption. HeartCry missionaries receiving theological resources at a Bible Conference. Theological literature distributed to HeartCry missionaries in Moldova. 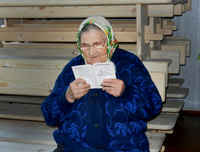 HeartCry supports the translation of theological resources for Russia. One of the many Russian resources handed out at a recent HeartCry Conference. Gustavo Requejo in front of the HeartCry library for missionaries in Lima, Peru. 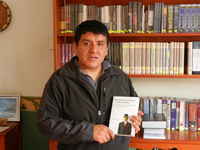 HeartCry distributed discipleship material to pastors in Pacaipampa, Peru. Sarvajeet receiving some books in 2011.